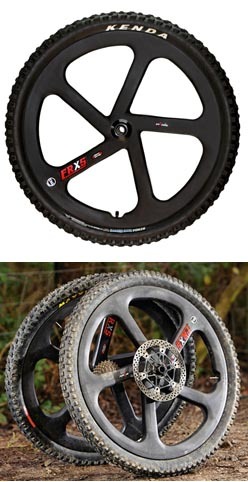 TAG Wheels®, the US manufacturer of the toughest, lowest maintenance bicycle wheels in the world, today announces a significant price reduction on their bombproof FRX5 wheelset. The new suggested retail price of $799US vs. $949US takes effect immediately. The FRX5 wheelset is a one-piece, hollow, reinforced, five-spoke composite wheel built around the reliable and durable DT Swiss 440 hubs. The wheels, which feature the star ratchet engagement system, accommodate most axle configurations with simple end cap adapters. "The price reduction is a strategic move to get more riders on the FRX5 wheelset," says Mike Thomas, Vice-President of TAG Wheels. "Clearly riders are looking for tough, long lasting wheels but the wheels need to be affordable. The FRX5 wheels take punishment, require ultra low maintenance, last for many years, and now they're even cheaper to own. All qualities customers tell us they want in a wheelset." FRX5 wheels are proudly made in the USA and feature a two-year warranty. The wheels boast a wide range of applications: from DH and freeride bikes, to urban and all mountain. In addition, TAG FRX5 wheels are used on gravity park rental fleets, police bikes, by pro stunt riders, aggressive and heavy riders. In other words the wheels are great for just about any riding style. And for IBDs, it's easy to become an official TAG dealer with the minimum order of just one wheelset. Plus, FRX5 wheels are available in the US through BTI Distribution. For more information on TAG Wheels FRX5, check out www.tagwheels.com.